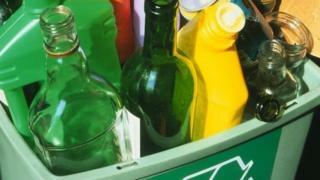 Recycling rates for Welsh councils have risen in the past year, according to provisional data. They reused, recycled and composted 62% of municipal waste in the 12 months to September 2016, compared to 58% in the previous year. Ceredigion was the best performing authority with a rate of 70%, while Blaenau Gwent was the worst at 52%. The Welsh Government has set all councils a target of recycling 70% of waste by 2024-2025. The data also showed a quarterly rise in recycling rates, with 66% of waste recycled between July and September 2016 - an increase of 5% when compared to same quarter in 2015. But the total amount of waste generated in Wales increased from 411,000 tonnes to 425,000 tonnes during the same period.